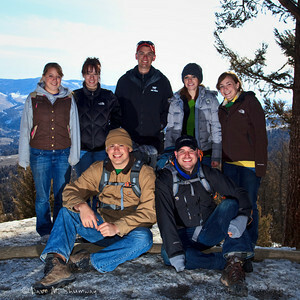 I took my ART380 class to Yellowstone for the weekend (March 20-21) and just now got everything online. The park was slow, for my taste; but this was the only time that all of my students were able to make the trip. As Rocky Mountain College is a small college (<1,000 students) my class is full with 10 students and an auditor. One of my students from the area had not been to Yellowstone in over 10 years, others had never been to the park, so even a slow trip provided a great experience for them. Their excitement for march Elk and Bison was refreshing (I am quite jaded). I shot another time lapse of the drive to the park it was shot from the vehicle of a student who was driving himeself. The settings and information is at the end of the video. Shooting from dark through sunrise was a challenge for a single exposure setting to handle; but it worked out OK'ish (using "Av" in place of "M" would have worked better; but flickering and blur would have become an issue).